I learned a lot from my brief foray into All Star Game electioneering with my #VoteAmarista campaign. I learned the various factions of voters, what motivates them, and the sheer difficulty in convincing a group of rational human beings to devote roughly 5 minutes of their day for a greater good. While the #VoteAmarista campaign was an abject failure, I think it may help in creating a cogent and coherent plan to maximize the Padres performance next season when we host the All Star Game. As a summary of the results of #VoteAmarista, I think we found a small, core group of voters that were willing to put in hundreds of votes per day to support the cause. I have no doubt that in total, this core group, including myself, put in upwards of 10,000 votes for Alexi Amarista. I don’t think everyone got that I didn’t think Alexi deserved to be an All Star, but that it was a combination of flicking off the All Star Game voting process combined with an attempt at gamesmanship in identifying the weakest point of this year’s All Star class and attacking. You’d have to be a moron to think Alexi Amarista is a serviceable starter, let alone a deserving All Star. Originally, I estimated we needed to convince about 500 people to at the very least, vote 35 times a day. I drastically underestimated the number of votes needed to win, as Jhonny Peralta ended up with 8.5 million votes, about double what I originally projected based off of early voting. I’d also hoped that this could be a fun cause that would unite the factions, that all of the Padres blogs and maybe even the Padres themselves could get behind. This didn’t happen due to a few reasons: general apathy towards All Star voting, dislike for Alexi as a player, and in the Padres case, a commitment to backing a clearly losing cause in Norris and Upton. I’m not trying to single these out as I saw similar comments literally a hundred times during the couple weeks of the #VoteAmarista campaign. And they have their right to abstain. It is just self defeating though. In my narrow gamesmanship view, my goal is to get as many Padres into the All Star Game, by whatever means possible. To ever get our players elected, we will need full commitment from the fanbase to either agree on players to cast votes for, or better yet, just to vote the entire team. For every vote cast for the entire team, a vote isn’t cast for the competition. In this case, it’s a zero sum decision. 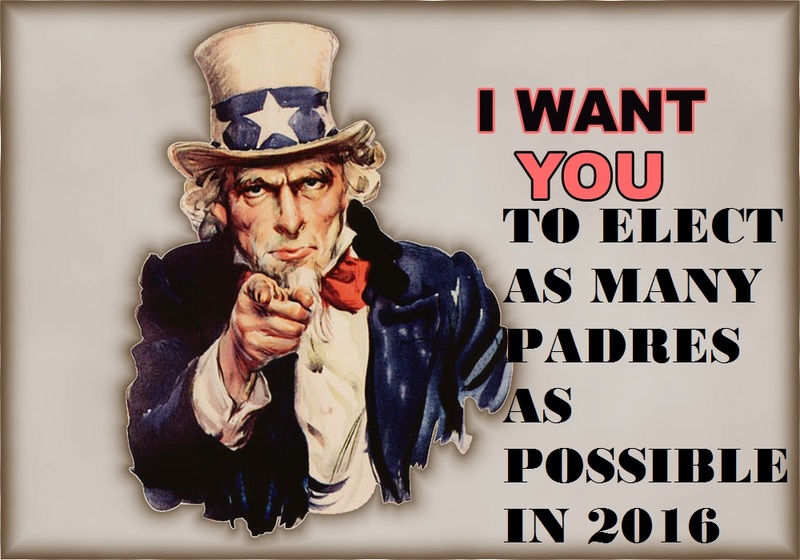 I’m of the belief, the goal should be to get as many San Diego Padres elected. Any strategy other than this will likely lose, as the other fanbases ARE using this strategy. Not committing to dropping “deserve” as a voting criteria is akin to bringing a knife to a gunfight. 4. Incentivize voters and don’t run a losing campaign: One thing I noticed is that some of the more successful All Star voting teams incentivized voters by offering discounted ticket codes to those who cast 35 votes. Of course, the Padres, masters of nickel and diming, offered nothing. In fact, they sat silent about All Star voting until about 3.5 weeks into All Star voting. At that point, the gap between Norris and, at the time, Molina, was too large to close. The same goes for Upton and Kemp and the outfield leaders. At the time the Padres started their campaign, the battle was already lost. Additionally, the extent of the Padres effort was to run TV spots on Fox Sports San Diego. Other teams placed ads across all forms of media, including local TV, newspapers, Facebook, Twitter, etc. Even small things, like what John Gennaro pointed out on Twitter a few days ago, the Astros changing their Twitter avatar to #VoteAltuve – lo and behold they got him elected. Strange what identifying a winning course and executing a strategy can do. With the Padres hosting, getting a single reserve selected would be embarassing. Hopefully the underwhelming Padres marketing department can commit some resources to actually winning a race, starting from day one. It wouldn’t hurt for all of us, bloggers, media, and the team to work together in formulating a strategy that can win. Any discord or differences in strategy will lead to a failed effort. You need look no further than the organization, unity and success of the team’s this season that got multiple players elected to realize we have very little margin for error. While #VoteAmarista was a fun little diversion for a couple weeks, I was happy to see people like Dan Szymborski pick up on the idea of voting in an anti-All Star team which included Alexi Amarista. While some think this year’s voting was too free wheeling, I think what Kansas City did was a great application of political science, rational thought, and good old fashioned team loyalty. Something this fanbase could use a dosage of, especially going into a year where we are hosting the game. I still remember when we hosted the All Star Game last in 1992. It was so exciting to see three Padres starters make the team: Fred McGriff, Tony Gwynn and Benito Santiago. Tony Fernandez and Gary Sheffield nearly were voted in as well. Did Benito Santiago deserve to win? Probably not. Was McGriff better than Will Clark? Who knows, maybe. The thing is, it shouldn’t matter. As a San Diego fan, it was thrilling to see MY players, regardless of merit, starting the game. Hopefully, we can get this same great feeling in 2016 by following through on a coherent, rational, and unified strategy to win the All Star Game voting for our Padres.